ADAM has developed a specific system which brings together all the peculiarities of a modular design OR: the SALUS System. It’s designed to satisfy the highest standards of cleanliness for sterilized areas. It includes a modular metallic framework that is able to get inside all the required utilities, an external cladding realized with different materials: Glass, Stainless Steel, Powder Coated Steel, Solid Mineral Surface and HPL. Salus system is completed by ceiling, led lights and automatic sliding doors. 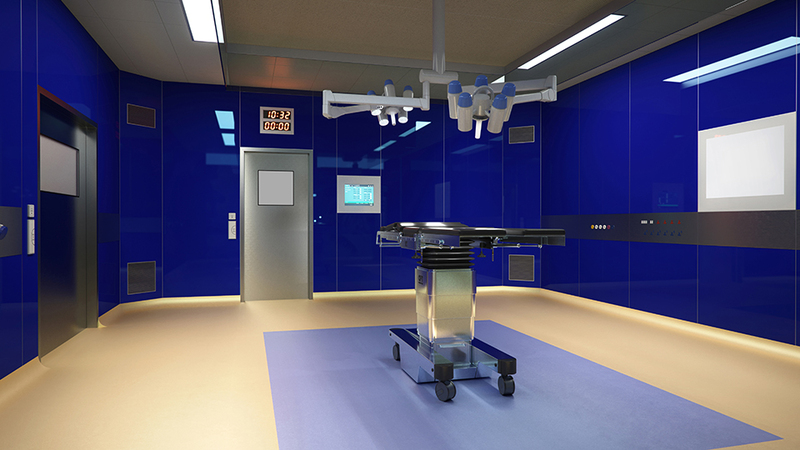 The technical systems available at a medical facility are decisive for the success of patient treatment. At the same time, the facility planning phase often prioritises their cost-effective use. Expert, detailed planning prior to installation and an innovative modular construction reduces both installation time and building costs.